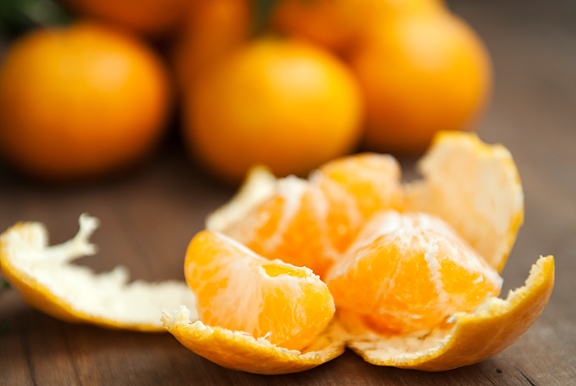 Have you ever had a fresh mandarin orange? I’m talking about the satsuma mandarin oranges that are in season (in the northern hemisphere) now. The first one I ever had was in California, back in my college days. I found them at the Pasadena Farmer’s Market as well as my friend’s backyard (she had TWO trees!). They came into season right around the time Jeremy and I started going out (do people still say that?). We’d go to the market on Saturdays and buy a bag of these oranges, tearing into them as we walked around the rest of the stalls. 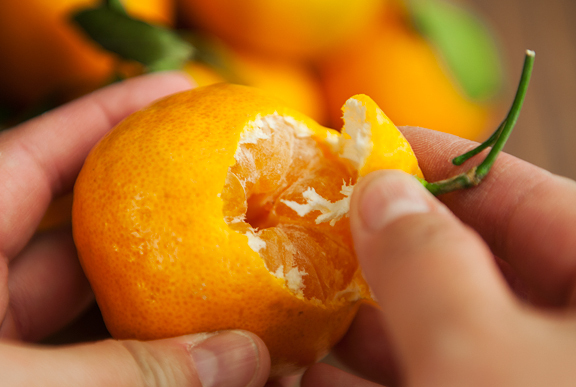 The skins were loose and peeled off easily and in one piece to reveal a plump ball of juicy, sweet orange segments. Satsuma mandarin oranges are better than candy. Throughout the week when we saw one another, I’d present Jeremy with one of these oranges. When he was home for winter break, I sent him a care package that included a tiny box with the last mandarin orange of the season in it. Jeremy saved it. On Christmas morning he woke up, reached over to the nightstand, opened the box, and relished that orange. Sweet little love letters. When we moved to the East Coast for graduate school, I never saw satsumas in the stores. 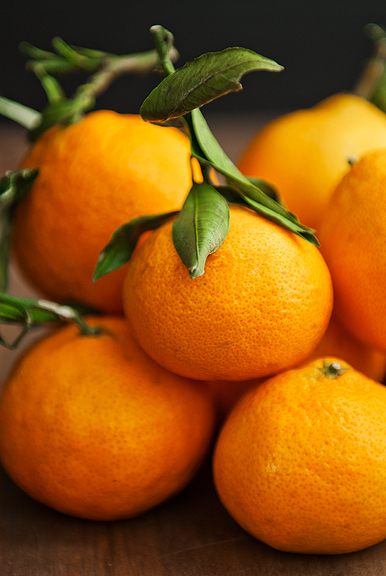 Instead, there were clementines – also mandarin oranges. Everyone gushed about clementines and I couldn’t wait to try one. Clementines are nice and cute little oranges, but you’ve got to be smoking crack if you think they are better than satsumas. I’m not sure if it’s because we’re back west or because they’re shipping satsumas farther afield now, but we get them fresh in our stores starting in November. We make a point of sharing the oranges when we’re together – a reminder of the simplicity and sweetness of those early days. I always think I’m going to be sad when summer fruits start disappearing. Everyone is cuckoo about summer fruits. But then autumn fruits begin popping up and I completely forget about those berries and melons and stone fruits. I don’t forget about the tomatoes though, but that’s another issue. I usually enjoy a fruit and yogurt salad in summer, but last month when my in-laws were visiting, I tried one with all of the seasonal fruit I had on hand. 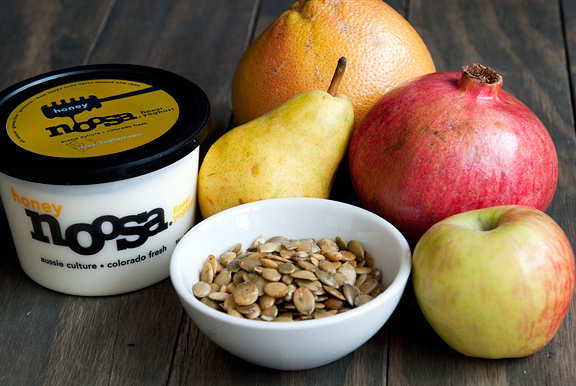 Typically, I will choose a plain yogurt and add honey, but I’ve been enjoying a local Colorado yogurt brand, Noosa Yoghurt. Their honey yogurt is lovely and my current favorite (the other fruity flavors are also wonderful). Prepare the fruit as you like. 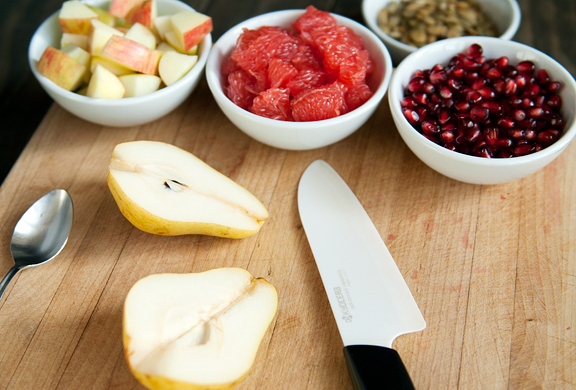 I prefer leaving skins on the apples and pears, but peel the grapefruit segments as clean as I can get them. And you don’t have to use the fruit I’m using – use whatever you like. Persimmons, oranges, cranberries, kiwis, grapes. If you don’t want to use pepitas, toss in some chopped nuts or granola or sunflower seeds. See? It’s up to you. Just make sure if you use hachiya persimmons that they are fully ripe or else be prepared to feel like you’re eating cotton balls. Actually, I feel the same about pears – I love pears, but not when they are unripe. I like to reserve the pomegranate seeds for last because they’re such a pretty jewel-like topping and have a similar crunchy texture to the roasted pepitas. Sprinkle a generous helping of both over the yogurt. The combination of citrus and yogurt may not appeal to some folks, but I really like it. Each fruit releases its own bite of sweetness or tartness. 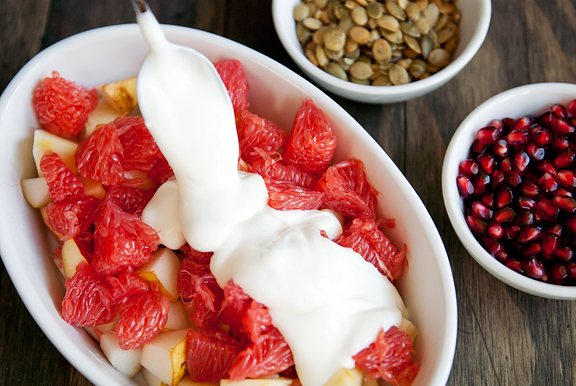 The textures range from soft to crisp to crunchy to juicy, all of it carried in a matrix of creamy yogurt. It’s delightful to have for breakfast, lunch, or snack. I miss summer less when autumn and winter are this good. 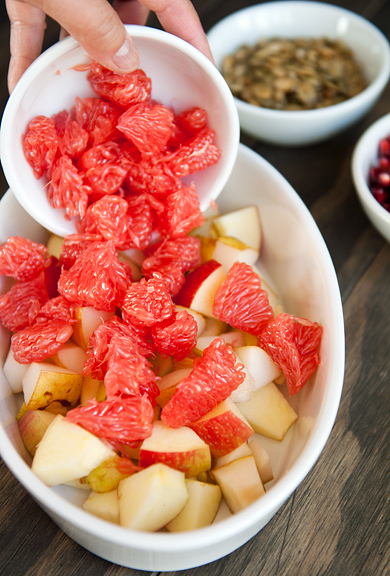 Place the apple, pear, and grapefruit in a serving dish. 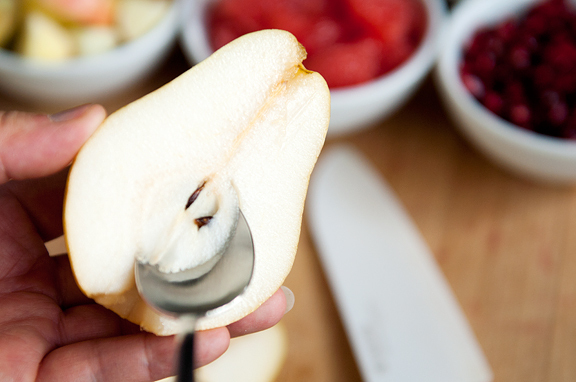 Spoon the yogurt over the fruit. 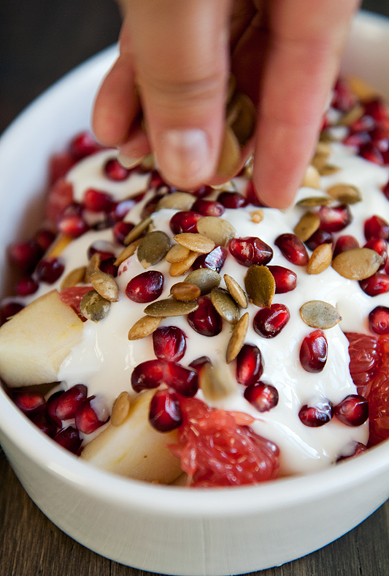 Top with pomegranate seeds and pepitas. Serves 4. A splendid salad! So healthy, colorful and tasty. What a refreshing change of pace from all the delicious but rich foods served at this time of year! If anyone served this to me on Christmas morning (or any morning), I’d be a very, very happy girl. Oh my good gracious! I have Greek yogurt w/ honey, fruit & almonds every morning, but I think I’m going to have to have this…soon! I love this! I need some more fruit recipes in my life and this is perfect! Also, I know what you mean when you’re talking about fresh mandarin oranges – heaven. I might have this for breakfast! Right now! The colors are just stunning. Sometimes I forget that Fall / Winter food can be just as colorful and beautiful as Spring / Summer food. Thanks for the reminder :) Now pass me a spoon because I want to dig in! It seems like Satsumas have always been around, here in Seattle. Our daughter was so excited to have Satsumas when she came home last week because she couldn’t find them anywhere in Boston. Only Clementines. I was surprised that they aren’t everywhere! I’m not usually a fruit salad kind of person, but yours looks fantastic!! I hope to find satsumas at my east coast grocer. Yum on the fruit salad, I like the idea of pepitas. 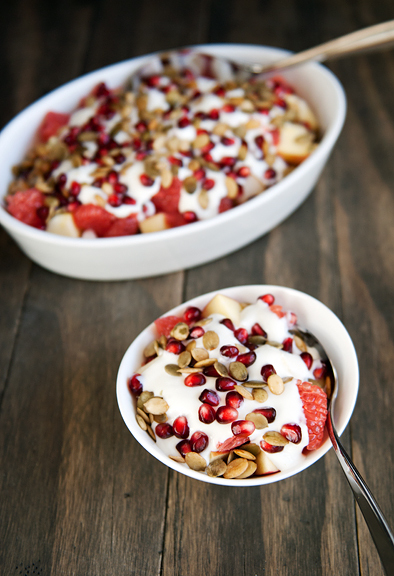 I make a similar dish for get-togethers, for a less sweet version try plain yogurt spiked with almond extract – my fave. I saw Satsumas in Whole Foods yesterday but I did not realize they were better than the clementines around at the moment. I will have to try them! My CA brother always sends CA organic satsuma mandarins to us each year at Christmas. Five pounds arrived yesterday and you know what happens when satsumas are in the house. They are beyond yummy! Ditto on seeing the satsumas @ WF yesterday. Do you eat the permission seeds? One of our neighbors has a satsuma tree, and I tried one for the first time right before Thanksgiving. They’re really amazing. Dear Jen – with lots of Thank You I wish you a Merry Christmas together with Jeremy and Kaweah! Sending you lots of LOVE ! I’m reading your Blog for several years now – never posted any of my thoughts before – I want to tell you, that I am always glad to get your e-mail to announce a new issue of yours for all of us. I really enjoy each of them. Hugs and all my best wishes for the upcoming 2012 ! Yummmm. This looks healthy and delish. My mother would love this! Wow, that looks so delicious. And the colors!! Amazing. I hope you have a Merry Christmas! I am not a yogurt person and will only have it when blended into a smoothie with fruits. But the way you serve it, mixed with honey seems to make things a bit more palatable! Got to try serving it with persimmon! I’m looking for detox ‘love-letters’ (the kind written in recipe form), to hail in 2012. This salad fits the bill. Bookmark, here we come. Rosa – happy holidays, my dear! Katrina – yes!! So happy to find fellow mandarin orange lovers! Theresa – Me too, I forget that fall and winter fruits are really wonderful as summer comes to a close. 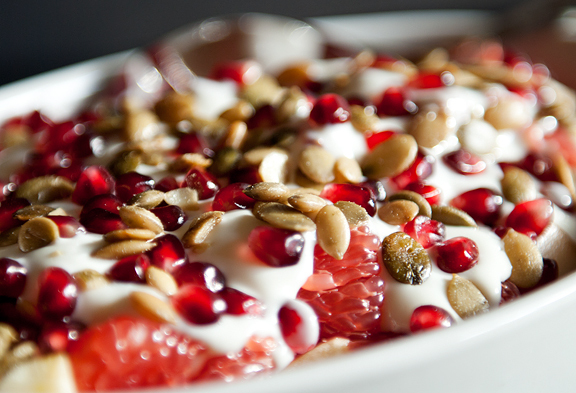 eileen – I usually use plain yogurt with a dribble of honey, but almond extract sounds great! Gwen – color me jealous. What a nice brother you have! laura h – yes, I do. If I didn’t eat the seeds I’d probably avoid eating them altogether because it’s such a pain to spit them out. Melanie – thank you, and you too! Mrs. Measurement – how nice of you to make it for her! Margie – yeah, I’m kinda over the heavy foods myself. The salad is so colorful! It looks so lovely. this looks absolutely amazing!!! so refreshing for the new year. I have to get my hands on a satsuma…I love those little clemenines.